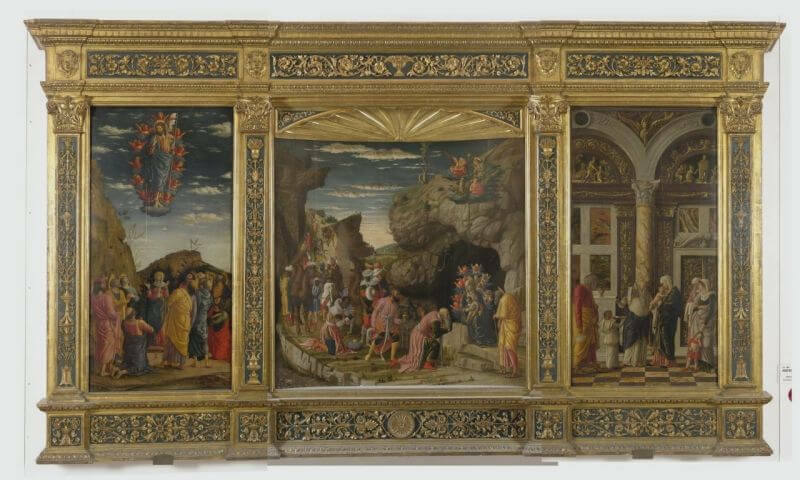 This table is the result of an arbitrary assemblage of three panels representing the Ascension (left), the Adoration of the Magi (center) and the Circumcision (right). The Ascension is divided into two horizontal bands: in the upper one is Christ who rose to heaven resting his feet on a cloud and surrounded by cherubs, in the lower one is the Virgin and the apostles. The Adoration of the Magi is among the best works of Mantegna. The Magi arrive by a road that winds up in the distance to stop on the foreground at the cave where are placed Mary and Jesus. Joseph is on the right leaning on a stick. Are part of the Magi followed a large number of characters and exotic animals. Circumcision is the most refined of the three scene. In the foreground are the priest and Mary holding baby Jesus in her arms, as also the prophetess Anna and Joseph. The background is an elegant room in classic style where you can recognize two bas-reliefs depicting the Sacrifice of Isaac, and the Delivery of the Tablets of the Law.